Last year LastFM sponsored Lucky Soul, along with others like Malcolm Middleton tried to create a social media groundswell of support to displace the inevitability of an X-Factor Christmas chart topper - however they did not succeed. This year there is a stronger challenge to Alexandra Burke 'Hallelujah', the official X-Factor winners' single. 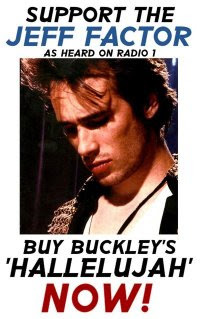 Jeff Buckley's version of 'Hallelujah' is, according to NME, the definitive version of the song. Jeff Buckley 'Hallelujah' is only available on digital download but looks set to enter the charts in the top 3 this weekend. So where has the support for Jeff Buckley's 'Hallelujah' come from? One word - Facebook. This seems a fitting way to end the year - thank you to everyone who has read or contributed to my blog over the last 12 months, hope to see you again in the New Year. Rickrolling live - Rick Astley to play Glastonbury?! This beautiful song deserves all efforts. Hi to the blogger, very interesting!